These organza or as you may know them Chiffon ribbons are 10mm wide x 45 meters long (50 yards). We stock other sizes too like, 15mm x 25 meters etc. Huge rage of colours available – Black, White, Silver, Gold, Red, Green, Navy Blue, Royal Blue, Light Blue, Light Pink, Hot Pink (cerise), Ivory, Orange, Purple, Yellow, Turquoise, Lilac, Burgundy, Apple Green, Chocolate, Wine (dark red / maroon) Brown & Cream. We will be adding more widths, lengths and colours in the near future. An Extensive range I’m sure you’ll agree. 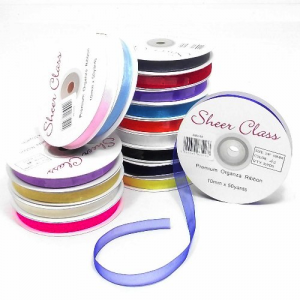 We’ll also be adding different widths, Colours and lengths of double sided satin ribbon in the coming days. Due to our customers requests we will be adding Gingham, polka dot, grosgrain and ribbon bows to our range within the coming weeks – it’s all in our warehouse now waiting for photos to be took and descriptions to be made for adding to the website. We also have a range of pearls and rhinestones that are currently getting packed up in our packaging which should be added to the website within weeks. Great blog! I am loving it!! Will come back again. I am bookmarking your feed. Hello there, just became aware of your blog through Google, and found that it’s truly informative. I am going to watch out for this in future.